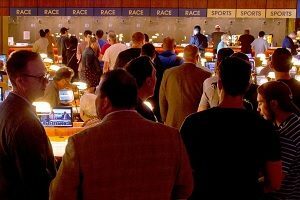 A recent survey by an entertainment research group found that many Americans approve of sports gambling. The Supreme Court recently ruled that states have the power to legalize sports gambling. The results of the survey shed light on which states might support legal sports gambling and which states might not. The survey of 1,200 Americans was conducted in all areas of the United States. Several questions were presented about the approval or objection to sports gambling in their area. In addition, Americans were asked to discuss which sports they might be willing to gamble on. The survey had twenty questions in all. Most Americans had no problem with nationwide sports gambling, especially in professional sports. Over sixty percent of Americans approved of sports gambling. However, less than fifty percent approved of sports gambling when college athletes are involved as part of the gambling process. This figure is interesting when compared to the number of Americans who approved paying college athletes. More men approved of sports gambling (sixty-nine percent) than women did. A little over fifty percent of women approved of sports gambling. Other results from the survey deal with legalization nationwide. Many sports viewers believed sports betting should be legalized and would bet more often if it was. Forty-two percent of people who watch sports programming bet on games. The average bet per player is $82. Of the people who bet on sports currently, one in three gamble offshore rather than in their home state. One in five is willing to discuss sports betting through sportsbooks. Nearly one-half of the respondents stated they watch sports programming on a regular basis so they can gamble. Almost twenty-five percent of the respondents have a bookie, even in states where sports wagering is not legal. Forty-six percent believe they would bet more often if nationwide gambling is legalized. Some of the respondents were unhappy with the opportunities for sports betting in their area. Twenty-seven percent stated they would love to gamble on sports, but gambling is not allowed in their area. Over eighty percent said they would watch more live sports if sports gambling were available nationwide. In addition, people also said if they would watch a greater variety of sports in addition to their favorite sports. Over sixty percent would watch new sports they had never watched before if sports betting were allowed in their area. Nearly eighty percent of the population surveyed said they would most like to wager on the Super Bowl. Only forty-three percent said they would bet on the NBA finals. Over half of people surveyed stated they would rather wager on championship games instead of regular season games. Finally, many people want to gamble using their phone or online because of new online games and apps. Over ninety percent want the option to bet on sports either through a website or through a mobile app. The prospective players also asked for in-game betting as well. Nearly seventy-five percent want the ability to place in-game bets as the sporting event takes place.